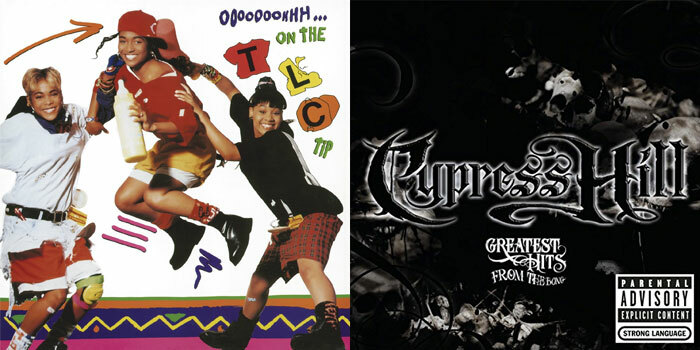 TLC, Cypress Hill, DJ Jazzy Jeff & The Fresh Prince, E-40, Ginuwine, Mystikal, DJ Quik and Run DMC are among the classic hip hop artists to get new vinyl pressings of their albums on October 13th via Certified Classics. These titles represent some of the greatest hip hop and R&B of the ’80s, ’90s and ’00s. Several titles are presented as brand-new color variants, and three titles make their debut on vinyl. Certified’s inaugural general retail release follows the successful launch of their official web store in August, which offers additional classic albums on wax, including exclusive pressings of albums by Aaliyah, Nas, Ghostface Killah and more. DJ Jazzy Jeff & The Fresh Prince’s He’s The DJ, I’m The Rapper will be available as double vinyl set. The Philadelphia duo of Jeff Townes and future movie megastar Will Smith made history in 1988, releasing the first-ever hip hop double album and winning the first Grammy Award for Best Rap Performance. “Parents Just Don’t Understand,” “Nightmare On My Street,” “Brand New Funk” and more are back on vinyl, newly remastered and available on the format for the first time since its original release, ahead of the album’s 30th anniversary this spring. E-40’s In A Major Way will be released on double white vinyl. Released in 1995, In A Major Way introduced mainstream audiences to E-40’s unstoppable flow and bass-heavy beats. The album was well-received by fans, with singles “1-Luv” and “Sprinkle Me” both hitting the Top 5 of Billboard’s rap chart and sending In A Major Way to No. 2 on the R&B chart—E-40’s first of nine consecutive studio albums to reach the Top 5 of that chart. Mystikal’s Unpredictable will be available as a double green smoke vinyl. Mystikal was already a fixture of the burgeoning New Orleans rap scene when he signed to No Limit Records and released his sophomore album Unpredictable in 1997. Boasting guest verses by No Limit founder Master P, Silkk The Shocker and Snoop Dogg, Unpredictable became The Prince of The South’s first of three Top 5 albums—and now, for its 20th anniversary, it’s being repressed on vinyl for the first time since its original release. DJ Quik’s Quik Is The Name will be released on “Tiger’s Eye” translucent vinyl. Born and raised in Compton, California, DJ Quik turned heads with his debut album, released on Profile Records in 1991 after a lengthy bidding war for the promising young rapper-producer. Quik Is The Name was certified platinum by the Recording Industry Association of America and was cited as one of the 100 greatest rap albums of all time by The Source. Fans who purchase these titles at participating independent record retailers will also receive a free custom compilation LP, Certified Classics Vol. 1. This promotional-only item is a handpicked collection of a dozen hip hop and R&B classics by A Tribe Called Quest, Aaliyah, Wu-Tang Clan, Destiny’s Child, OutKast and more! Releases by Cypress Hill, Mystikal and Run DMC will be available exclusively through FYE. Run DMC’s Ultimate Run DMC will be pressed on double “Salt ‘N’ Peppa” translucent vinyl. This 2003 compilation features the legendary Queens rap group’s best-known tracks, including “Walk This Way,” “It’s Tricky” and “King Of Rock,” plus the worldwide No. 1 remix of “It’s Like That” by Jason Nevins.